With our history of analysing samples from Manufacturing, Mining, and Construction industries we have developed a simple equipment monitoring system with single glance analysis results providing our customers with a ‘Root Cause Analysis Diagnosis’ on every sample. Through our associate companies we can also provide world class vibration analysis monitoring, metallurgical analysis, scanning electron microscope analysis and root cause failure analysis type services. When monitoring critical industrial plant & manufacturing equipment R&T’s recommendations are aimed at operating critical machinery as close to “Zero Wear” as possible. We are able to analyse a sample and identify through microscopic observation contaminates and potential causes of wear. With these observations, R&T provides customers with visual images of the contamination and abnormal wear occurring in the equipment under their care. 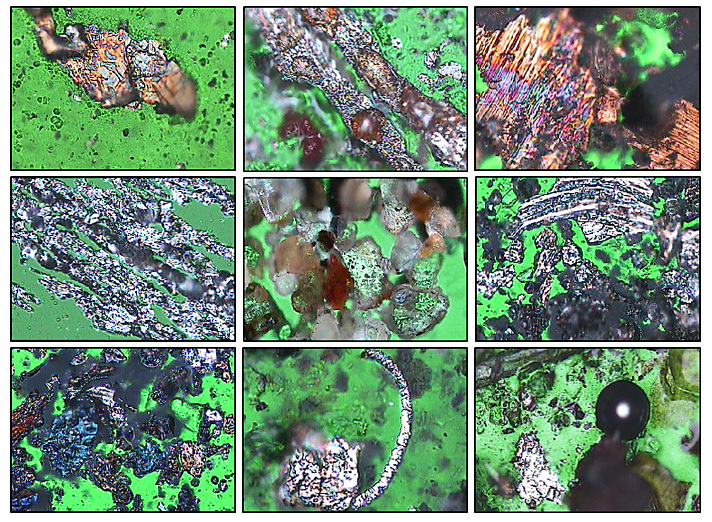 The showing of wear debris contamination images to the Equipment Maintainer provides an immediate understanding of how the machine is wearing abnormally. Once the remedial advice from the R&T analysis report has been implemented the Equipment Maintainer can also see from following reports the resulting reduction in abnormal wear due to their maintenance work providing 100% reliability plus, feedback and job satisfaction for maintenance staff. • Digital Imaging/Photography of Industrial Equipment. • Design of Lubrication Systems & Schedules. • Image recording of Machinery Inventories. • On Site Contamination Investigation. • On Site Lube Sample Taking. • On Site Machine Reliability Improvement. • On Site Tutorial for oil sampling and contamination control. • Root Cause Failure Analysis. E: lab@rttech.com.au P: +61-2-9698-8840(AEST 8am-5pm MON-FRI) Examples of our reports are available for viewing here. Breakdowns of our standard report layouts are available for viewing here.